Stream the first episode of Home Sweet Office now and watch how Shagun decides on a brilliant plan to expand the merchandise business! 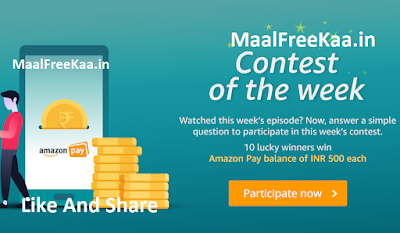 Head over to and answer a simple question to participate in our weekly contest and win exciting rewards! Meet Adhira and Shagun, two sisters who have big dreams of opening and managing their own business. This episode, watch as the two sisters navigate hard decisions choosing between their business and their personal lives! Shagun is willing to go to any lengths to keep the business running, even if it means shooting a wedding film for Adhira’s ex-boyfriend- Akhil! Adhira is furious and tries her best to sabotage the project. Meanwhile, Shagun decides on a brilliant plan to expand the merchandise business. Watch the episode to find out how the drama unfolds Participate 1st Episode of Amazon Home Sweets Office Contest win Free. What does Adhira do in the same time that Shagun takes to register on Amazon.in? Get to know the people of Home Sweet Office. Watched this week's episode? Now answer a simple question to participate in this week's contest 10 lucky winners win Amazon Pay Balance of INR 500 each Winners will be announced on 6th March here.